Kind of taken back, mostly because of the look on her face. I could tell she had been giving this a lot of serious thought. Since most of you have never met my daughter, I feel I have to describe her a little bit to give you the full picture behind this scenario. First thing you gotta know is she is way to smart for her own good!! She looks like a 6 year old. Her attitude is even that of a 6 year old, but the mind behind those big blue eyes is that of a much older person. So I’ve learned to take her seriously when she really wants to know something, even if it’s as little of a thing as why I love to cook/bake so much. But still I had to laugh a little bit about how serious she was about it. So long story short, we jump into the conversation. We go from peoples talents and gifts, to how Nanny (my mom) also liked to cook, and finally we get to things my mom used to make me for Valentine’s Day. This is one thing I described to her and she demanded I make it. I actually had forgot how good this stuff is. So simple but yet still one of my favorite cakes to this day. And I remember now why it was so fun to make with my mom. There is just something so mad-scientist fun about poking something and pouring liquid over it. 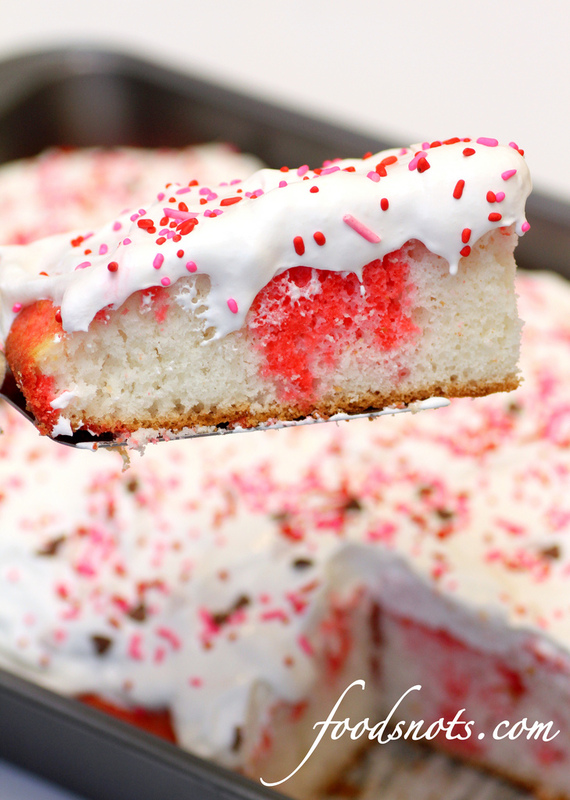 It’s the perfect Valentine’s Day cake activity for kids. Enjoy!! Prepare cake as per cake directions. Bake in a 9 x 13 inch pan (this cake works best in a 9 x 13, but we used the heart cake pans for Valentine’s Day). Let cool to room temperature. When cooled, use a fork to poke multiple holes in the top of cake and pushing 3/4 the way to the bottom. Prepare Jello mix as per directed on the package. After preparing immediately pour over the top of cake slowly and making sure to pour evenly over the entire top of the cake. Place cake into fridge and let chill. At the same time pull the tub of whipped cream out and let it de-thaw. After about 20-30 minutes in the fridge, pull out the cake and frost with the thawed whipped cream. Decorate with sprinkles if desired and serve. Refrigerate any leftovers.